A few years back, when music was in the throes of a major '80s revival (think La Roux, Goldfrapp's Head First, Little Boots, Fischerspooner), there was one trend from that decade that didn't really enjoy a resurgence: the power ballad. Sure, songs like "Someone Like You", "Wrecking Ball" and a fair few Ryan Tedder compositions have given it a shot over the past few years, but for me, they've all lacked that certain something that defined an '80s power ballad. This week in 1985, the top two new entries on the ARIA singles chart were proper power ballads with big sing-along choruses, over-the-top emotion and the odd choir thrown in for good measure. Modern ballads tend to play it too cool - you really need to go all out with a power ballad, and these two songs did just that... all the way towards the top of the chart. At the top this week in 1985 - Band Aid's "Do They Know It's Christmas" dethroned "Like A Virgin" for the start of a four-week run at number 1.
Who would ever have expected Vanda & Young of The Easybeats to end up in a synthpop band? Initially successful in Australia in the late '70s, interest in the new wave act had waned by 1985. It was inevitable. Since every other member of the Jackson clan had released an album, eldest sibling Rebbie finally got around to hers. This lead single was written and produced by Michael. 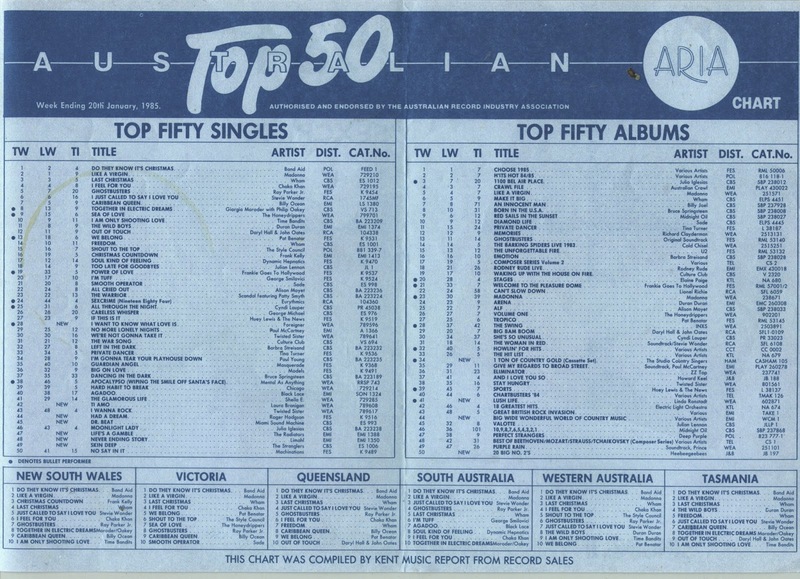 Australia had passed on this song first time around - it peaked outside the top 100 - but following the success of "If This Is It" (which was still in the top 30), "The Heart Of Rock & Roll" finally got a look-in. More under-performing Australian synthpop from the Brisbane group whose debut single had previously featured on the soundtrack to ABC series Sweet & Sour before they released their own version. How did this single - a UK number 1 and a US number 2 - perform so badly in Australia? Well, it's complicated. Philip Bailey's label, CBS, initially released it here in late 1984, before being told that Phil Collins' label, WEA, had the single rights for Australia. CBS had to pull their copies from stores and then WEA refused to give it a full local release, since the song wasn't on Phil's album. And so, this minor top 100 entry for "Easy Lover" was due to those initial CBS copies and imports from New Zealand. A blight on Phil's otherwise impeccable chart record between 1983 and 1985. Australia hadn't been interested in The Stranglers until they moved away from their punk roots for the sophisticated sound of 1982's "Golden Brown", rewarding that song with a number 10 peak. The lead single from eighth album Aural Sculpture, "Skin Deep" did almost as well, but it would be another two-year gap before the band landed their next hit. The Stranglers are still around today, with the core of Jet Black, Jean-Jacques Burnel and Dave Greenfield having been present since the mid-'70s, however this song's vocalist, Hugh Cornwell, left in 1990. About as subtle as an overblown power ballad, this soundtrack single from the ex-Kajagoogoo singer has everything you want in an '80s hit - a curiously coiffed singer in what looks like double pleather, Giorgio Moroder production, random female vocals from an uncredited vocalist (who's not the woman in the clip), a key change. The theme to the movie of the same name, "The NeverEnding Story" equalled the peak reached by "Too Shy", the biggest single by Limahl's old band. The song would also have qualified him as a one-hit wonder in his own right were it not for the number 50 placing of prior single "Only For Love". Elsewhere on this blog, I've mentioned my eldest sister's influence on my musical taste. Howard Jones, Madness, The Cure, The Style Council... her love of all those acts rubbed off on me. She was also a huge fan of The Radiators - or The Rads (as in "Rads Rule") - but for the most part I avoided anything to do with them. After all, one of their early songs was a charming track called "Gimme Head" and I was a kid who didn't even want to go and see an M-rated movie in case it was too rude. Anyway, this is the exception to the no-Radiators rule for me (I even borrowed said sister's best of CD to rip it into my iTunes collection) - and I'm kind of surprised it wasn't a bigger hit. But then, The Radiators were never that successful, peaking at a career-high of number 27 with 1983's "No Tragedy". Between 1977 and 1984, Latin group Miami Sound Machine released seven albums before tackling the English-speaking world with Eyes Of Innocence - and interestingly, Australia and the UK showed interest way ahead of America, where the band would have to wait until later in 1985 for their first hit with "Conga". Their first international single, the infectious (pun intended) "Dr. Beat" hit number 6 in the UK and fell just short of the top 10 locally. Twenty years later, it'd return to the ARIA top 20 as part of Mylo's mashup hit "Doctor Pressure", which peaked one place lower. I have to admit, I had never heard of this song or artist before putting this post together - something that surprised me given it was a decent-sized hit and while I might not have been collecting the ARIA chart by 1985, I was certainly following it on TV and radio. Turns out, even though I didn't recognise the name, I do know Roger Hodgson's voice from his time as one of the two main vocalists in Supertramp. "Had A Dream (Sleeping With The Enemy)" was Roger's debut solo single and performed considerably better in Australia than either the UK or the US. Think the six-minute music video below is lengthy? The song clocked in at even longer eight-and-a-half minutes on the album In The Eye Of The Storm. Seems you can take the guy out of the prog rock band, but you can't... well, you know. Here's the first of our two epic ballads - and it was yet another song originally recorded by Italian singer Umberto Tozzi that Laura Branigan transformed for the English-language market. The others? Australian chart-topper "Gloria", for one; Branigan 2 album track "Mama" for another. And like the latter, "Ti Amo" received a little help in translation from future A-list songwriter Diane Warren. A little histrionic for my liking, "Ti Amo" nevertheless became Laura's second-biggest hit in Australia - and one of four top 5 hits for her locally. Besides "Gloria", there was 1983's "Solitaire" (number 5) and 1984's "Self Control" (number 3). When you think of the biggest '80s power ballads, this has to be somewhere towards to the top of the list - and it did what five other Foreigner US top 5 hits couldn't by going all the way to number 1 in America. It also topped the chart in Australia and the UK, where Foreigner's only previous top 10 hit was warm-up ballad "Waiting For A Girl Like You". A massive song - thanks in no small part to the presence of the New Jersey Mass Choir - it ended 1985 as Australia's fifth-biggest single. In subsequent decades, "I Want To Know What Love Is" has been covered by two singers who know their way around a power ballad: Tina Arena and Mariah Carey, but nowhere near as effectively. Next week: one of my favourite songs from 1985 arrives, as does the Australian funk act that'd launch a future ARIA Award-winning female singer on an unsuspecting public. Before then, I head to 1990 for 25 Years Ago This Week. I hadn't really listened to 'Centipede' until now... interesting. I'm pretty sure 'Easy Lover' charted so lowly here because of a dispute between the local branches of Phil Collins' and Philip Bailey's record companies over which should distribute the single. As it couldn't be resolved, the single was withdrawn from sale. It was a massive radio 'hit' here though, making the #74 peak seem even more bizarre. 'Skin Deep' is one of those songs I knew, but didn't know who it was by, until they programmed rage in 2004 or thereabouts. Turns out I knew several Stranglers' songs in the 80s ('Always the Sun' being a favourite of mine, though I think I thought it was by Sting?! ), but never knew who they were by. I don't remember seeing the video for 'Never Ending Story' until the early 00's, and was shocked by how low-budget the Limahl scenes look. Never heard the previous 'hit' until now. 'Doctor Beat' is another song I knew, but never knew who it was by (or that it was Gloria Estefan singing it) until years later. I loved the mash-up with Mylo. Never heard of the Roger Hodgson song until now, but it sounds vaguely familiar. Laura Branigan's 'Self Control' album was actually my first album purchase, while living in New Zealand. I was surprised this was such a big hit locally though, because I don't recall hearing it anywhere, other than on my cassette, in NZ (and see that it only peaked at #49 there). I'm even more surprised that it was such a big hit here in 1985 without a video. 'I Want To Know What Love Is' is pretty much the perfect ballad, and its one of those tracks that takes me back instantly to the time when it was released. More really good songs in the new entries. I Want To Know What Love Is is a classic. Ti Amo is another good one, Dr Beat is ok and Skin Deep and Had A Dream are good tracks from acts I'm otherwise not that interested in. Of the breakers, Rebbie Jackson's is an interesting oddity, and Easy Lover is by far the best Phil collins song, so it was a shame it was withdrawn. I didn't know it charted at all until years later, but I remember listening to American top 40 when it peaked at #2.